I believe the title says it all about this blog post. I love --amend, but sometimes, well, most of times, the commit message is just the same, there is no need to edit it. We are just forgetting to add files or simply fix some typos. I found out how to keep the message via tab-completion, then I was disappointed, because you have to use --no-edit, no shortened option now for use. I was hoping something like -M.
For me, let Git bring up editor and save and quit is the faster way, but still good to know this option. As for Mercurial (Hg), it has --amend, but no equivalent --no-edit. gitfiti, an interesting idea to paint graffiti on GitHubs commit history calendar, though it probably doesnt have much practical value beside becacuse its fun and I can do it! The creation of gitfiti wasnt quite clear when I started. There were five repositories in the screenshot. I used five because its easier if I messed up with week offset, I could just delete a repository and recreate with correct week offset. Anyway, with vcsstat.sh, two extra modes. 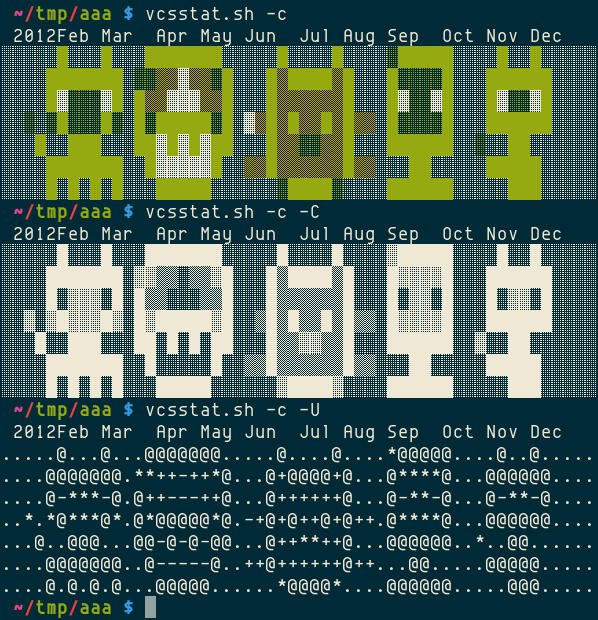 There seemed to be some calculation issue with vcsstat.sh, some days colors are off, but Im not up to fix it. It is hardwired in me and Mercurial (Hg) has st as a shortcut, so it gets harder to remember to type the full command when I am using Git. You can manually edit the file if you want. Instead, you can create local alias command which only be used by single repository and configuration is stored in that repository only. But for status command alias, global availability suits better. ci is a good one to be added for commit command, the second common command for me to get error message from Git, but that's history, too. If you have used GitHub, you must have already been familiar with gh-pages branch. I don't like have different code base from the pages branch, so in my projects, master == gh-pages, and many of projects are doing the same. If you have documents like library reference which is generated by source, then you probably will use different base. repository is to be updated. actual ref must be named. If :<dst> is omitted, the same ref as <src> will be updated. Well, it's all in the manual and I was actually using a shorthand by omitting the <dst>. It's good to know. that you are not specifying it. See hg manpage for DATE FORMATS section. You can grab the script here. The script will list all directories and look for VCSes special hidden directory. Currently (and probably only will be), it only supports Git and Mercurial (Hg). As you can see, there are two types datespec used. Git and Hg have some differences, I need to separate into two. Its MITd and hosted on GitHub, feel free to request features or even better, open pull requests! (Patch might be more suitable, or you need to publicly fork my dotfiles on GitHub). I wrote this because I believed I had caffeine overdose (xD), but clearly, from the screenshot above, I didnt have. Gotta have my cup, gotta have caffeine! Edit: Damn forgot this blogs timezone is set to Pacific time Its still FRIDAY, YEAH! I created a project on github for mirroring my project on Google Code. I am new to git, so maybe there is a better way to do this.